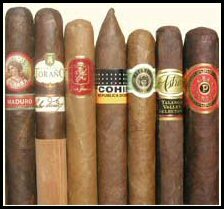 Premium handmade cigars from some of the best cigar brands in the world at a discount! Indulge with cigars from Cohiba, Padron, Arturo Fuente, Macanudo, Montecristo, Partagas and more! Most of our premium cigars are available in packs of 5 or full-boxes. We think you will find our prices quite competitive with any other vendor in the industry and we offer our 100% Satisfaction Guarantee to help assure you of the quality of our products! Among our fine cigars you'll find Dominican cigars, cigar samplers, flavored cigars, mild to bold cigars, cigarillos and some the best cigars found anywhere.